I am kicking off February month with inclusion of more protein along with more calcium and low on sugar. Trying to be as healthy as I can but that does not mean I am going to be skinny because ………… I am a big foodie and cannot control my love for food. Yet I can be fit and healthy by making right choices and right methods of cooking. What say????? I came across this delicious vegan cheese while browsing through the grocery store aisle. I don’t think I have to stress enough on how big of a cheese fan I am. A bit fussy with the flavors of vegan cheese hence I end up eating the same cheese over and over again. Therefore, I needed a change. I grabbed this tree nut cashew based garlic herb flavored vegan soft cheese. I loved it so much that I kept licking it throughout the day. While licking my fingers and yearning for a sandwich a recipe suddenly came to my mind. I quickly started with it. I sauteed some fresh chopped jalapenos along with crumbled tempeh and topped it with this vegan cheese. Later, seasoned it with salt and crushed pepper flakes. Made a warm sandwich with whole grain bread slices in a sandwich maker with more cheese in it. I ate Jalapeno Tempeh Cheese Sandwich hungrily and felt super satisfied. These sandwiches are so versatile that they can be eaten for breakfast or brunch with a healthy smoothie, for lunch or dinner with a side salad. 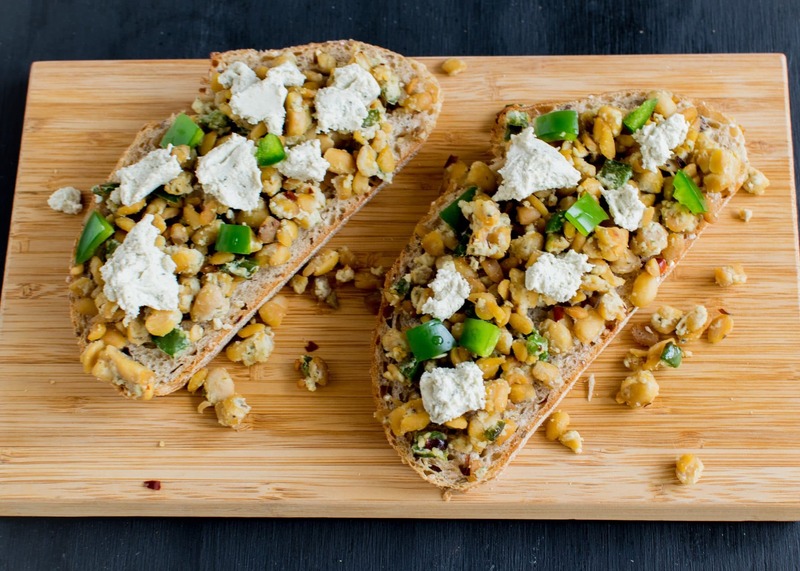 The added attraction of this recipe is that the sandwich stuffing can be made ahead of time and can be refrigerated in an air tight container for 4-5 days. That way meal prep becomes easier and food is always ready at any time of the hour without too much fuss. Heat oil in a pan and sauté chopped jalapeno until golden color. Add crumbled tempeh and cook on medium flame until brown in color stirring at intervals. Add cheese and mix well. (In order for the cheese to mix well with tempeh whip it first in a bowl and then mix in the pan). Add salt and crushed chili flakes. Mix and cook for couple of minutes. Turn off the flame. 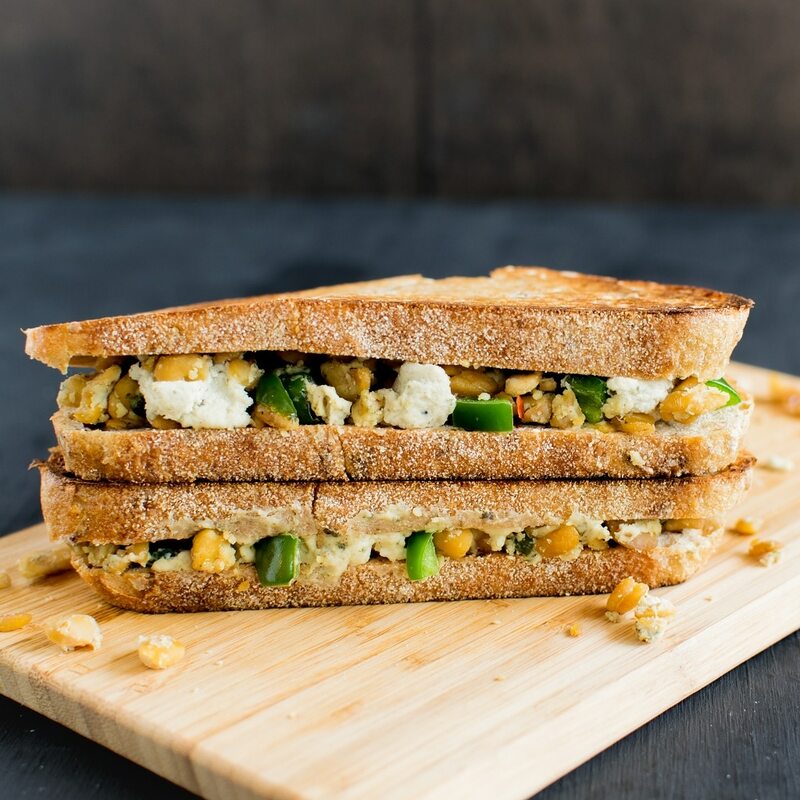 Spread the stuffing on the bread slices, add more cheese on the stuffing (if you are a cheese lover), cover it with another slice of bread and make a sandwich in a sandwich maker or on a pan or grill it. 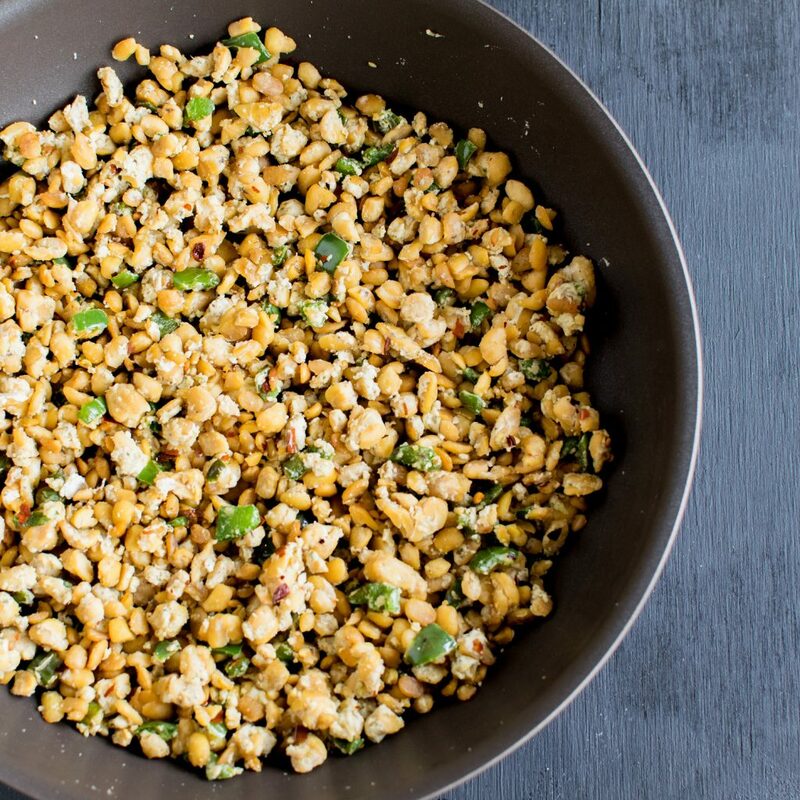 The stuffing can be made ahead of time and can be refrigerated. I used vegan cashew soft cheese (herb garlic flavor) from Treeline tree nut cheese. You can use any other cashew base flavored soft cheese. It tastes really good with additional cheese in the sandwich as one of the layer along with the stuffing. Depending on your palate you may increase the spice level by not deseeding the jalapeno peppers. For those who do not follow vegan diet can use regular garlic herb flavored soft cheese or garlic herb flavored cream cheese. (If not available then just whip up regular cream cheese along with dried garlic, dried basil, dried chives, dried parsley and salt if desired). For gluten free option - make sure to buy gluten free tempeh that does not contain wheat. 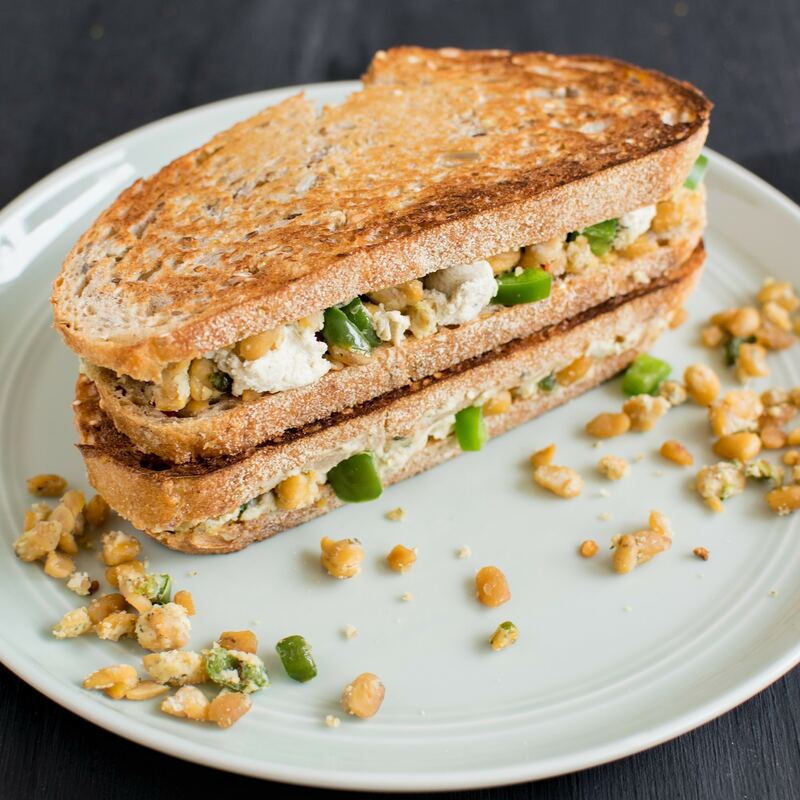 Make this sandwich in a gluten free berad that is easily available in the stores or your home bakes gluten free breads. To avoid carbs in your diet this tempeh stiffing amazing as a lettuce wrap. I personally prefer it as a lettuce wrap. This looks so yummy! I’m adding these ingredients to my grocery list so I can try it out this weekend. Thanks for sharing! Thank you Julie. Let me know how it turned out for you. Enjoy!!!! Thank you Carmen. Its easy too. This looks HOT but delicious. Thanks for sharing. I love tempeh, I used to eat it a lot more when I was a vegetarian, but now I eat it on occasion. I really love this dish and can’t wait to try it! This looks delicious, I love anything and everything with jalapenos. Will be trying it soon! this looks absolutely amazing – can’t wait to try it! Jalapeno is too spicy for me, I’m a weeny, but my husband will enjoy this for sure! I never think to use them since I don’t eat them, ha ha! This looks and sounds amazing! I am vegan so I eat a lot of soy products. I tend to eat more tofu than tempeh for some reason. I need to put it on my grocery list! Pinning for later.